Lilly is a seven-year-old Boxer who lives with the Stewart-Andris family and loves nothing more than causing havoc with her five-year-old sister Tara. 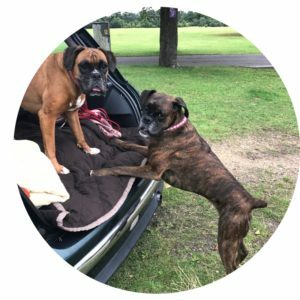 They were both referred to Fitzpatrick Referrals at the same time by their family vet in November 2016 with pelvic limb lameness and were admitted by Russell Yeadon with suspected cruciate ligament injuries. On clinical examination, Lilly was affected by right pelvic limb lameness and pain affecting her right stifle with effusion and medial buttress formation (fibrosis). Slight cranial drawer instability was noted in flexion. Tara was affected by mild bilateral pelvic limb lameness and pain on extension of her stifles along with effusion and medial buttress formation (fibrosis). She had a greater degree of muscle wastage on her right pelvic limb than her left. After a night spent in the comfort of their own beds at home, Lilly and Tara returned the following day for surgery. They were anaesthetised a few minutes apart and transferred to the imaging team for radiography. X-rays confirmed evidence of right stifle joint effusion in Lilly and bilateral stifle joint effusion in Tara, as well as mild osteophytosis in both. These findings were consistent with a diagnosis of cranial cruciate ligament tears for both dogs. Lilly and Tara were both prepared for surgery and successively underwent the same procedure on their right stifles, with Tara operated less than an hour after Lilly. Russell performed a mini-medial sub-patellar arthrotomy of the right stifle, which confirmed a 90% rupture of the cranial cruciate ligament for Lilly and a 50% tear for Tara. Meniscal tears were not identified in either dog. 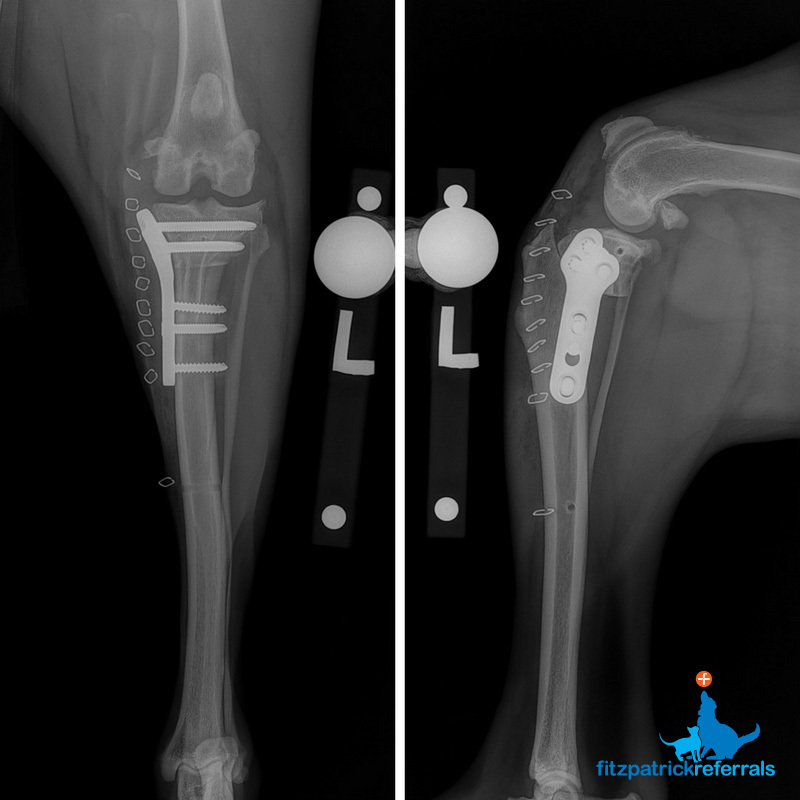 Both dogs then underwent standard tibial plateau-levelling osteotomy (TPLO). 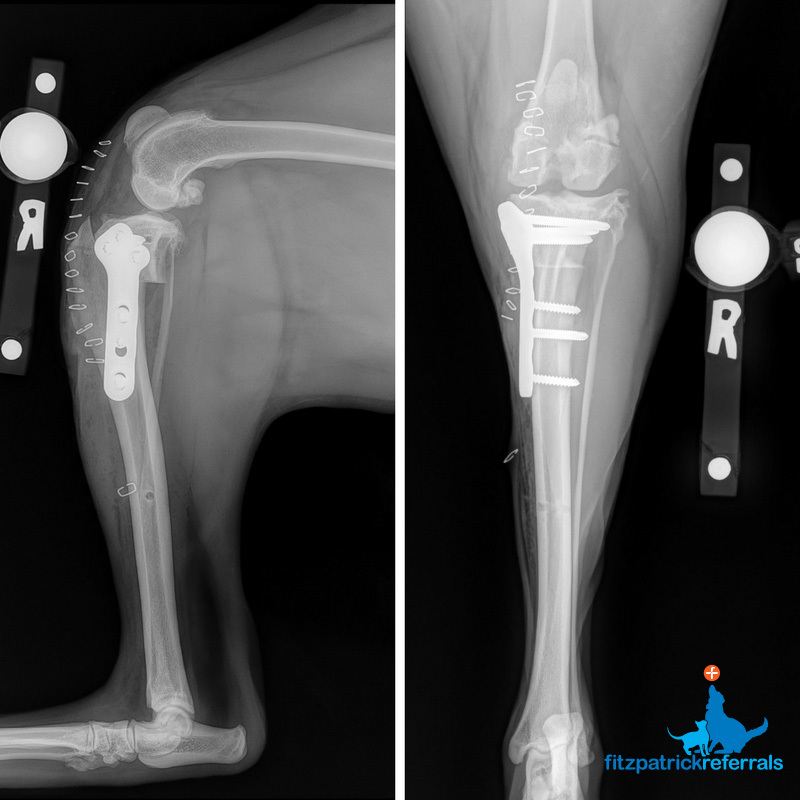 The osteotomies were stabilised with Synthes 3.5mm 6-hole TPLO plate and screws, with the ‘small’ variant of this plate being used for Lilly to suit her more delicate bone anatomy. Postoperative radiographs confirmed satisfactory alignment and stability. Post-op X-rays of Lilly stifle following TPLO surgery. Following the surgery, Lilly and Tara recovered in adjacent kennels and walked outside together for toilet breaks and fresh air. 24 hours after the surgery, Lilly and Tara started to weight-bear on their operated limbs and were comfortable enough to go home with anti-inflammatory medication and exercise restriction. 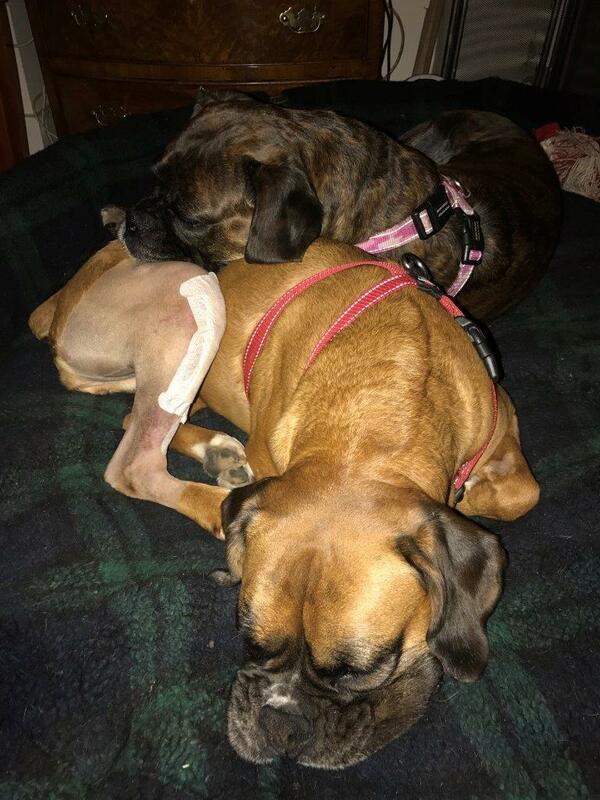 Lilly and Tara recovering at home after surgery at Fitzpatrick Referrals. Seven weeks postoperatively, Lilly and Tara had recovered well with significantly reduced lameness. Both seemed comfortable on stifle joint examination and manipulation. Follow-up radiographs confirmed good positioning of the metal implant and satisfactory osteotomy healing. 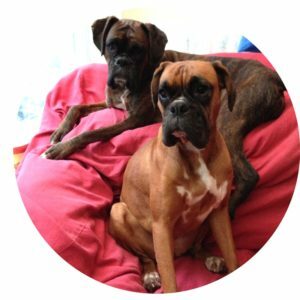 Lilly and Tara have since then literally come on in leaps and bounds and now live a fully functional and happy life together in their family home. Fitzpatrick Referrals continue to work with their family vet as part of the care team for Lilly and Tara to manage postoperative reassessments and monitor their progress. 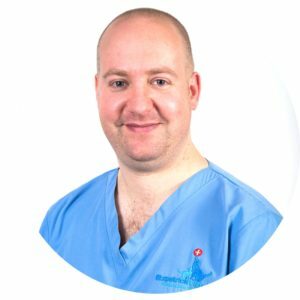 “My journey with Fitzpatrick Referrals has been epic. Four boxers over a period of ten years, each of which have experienced the little bit of the ‘magic’ that Fitzpatrick Referrals offer. Roxy on recovery from a car accident and then consequently Scarlet with two TPLOs, Tara with one TPLO and Lilly with two TPLOs. From the caring attitude of the receptionists to the nurses and vets, there has always been a sympathetic and understanding ear coupled with a pragmatic approach to achieving the best for each of my girls. I have always known that the advice and treatment offered will be what is best for them. 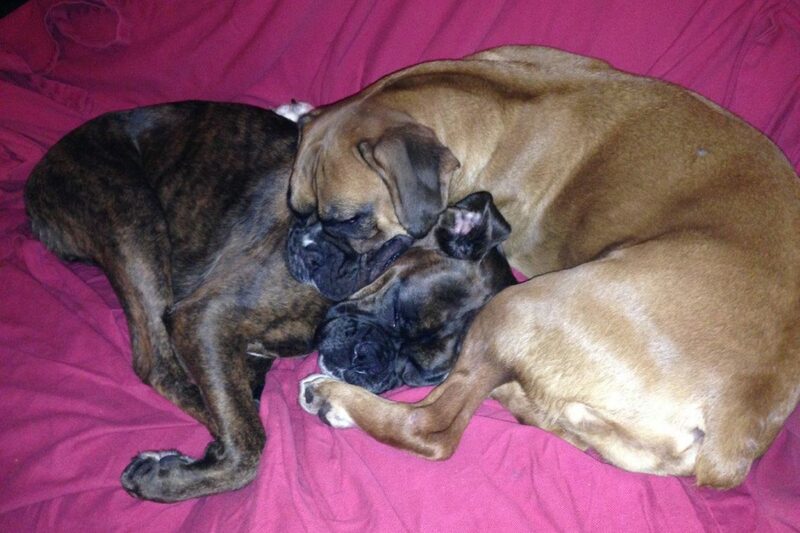 “Lilly and Tara are gorgeous dogs who are obviously very attached both to each other and to their human family. They are both very affectionate and enthusiastic but also have very distinct personalities, sometimes competing with one another for attention. Read more about cruciate ligament disease or injury and the treatment options.